Sweden has become a hotbed for piracy lawsuits and the number of targets continues to rise. Newly released details show that more than 35,000 IP-addresses have been listed in so-called copyright troll cases thus far in 2018. That's more than in the US and Canada combined. Swedish Internet provider Bahnhof is calling on the Government to curb this trend. Roughly a decade ago, Sweden was considered a safe haven for pirates. The country is the home of the Pirate Bay, the birthing ground of the Pirate Party, and a place where for many citizens file-sharing was second nature. Today this is no longer the case. The Scandinavian country famously prosecuted the Pirate Bay’s founders and lawsuits targeting individual BitTorrent users are no longer an exception. 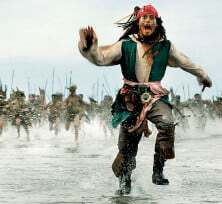 The ‘copyright trolling’ phenomenon, in which movie companies target hundreds or thousands of alleged pirates hoping to secure monetary settlements, is commonplace now. The first wave of these lawsuits started in 2016 but the practice has grown exponentially since. 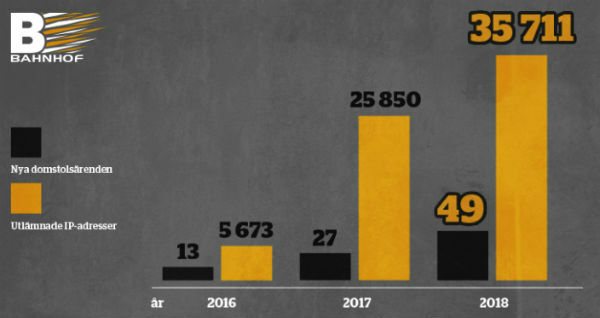 According to Swedish Internet provider Bahnhof, which keeps track of these cases on a dedicated website, records are being broken this year. “Thousands of Swedes have received threatening letters from law firms which accuse them of illegal downloading. They are asked to pay a sum of money, ranging from a couple of thousand Swedish Kronors up to several thousand, to avoid being brought to justice,” Bahnhof Communicator Carolina Lindahl notes. This year to date, 49 separate court cases have been filed requesting ISPs to disclose the personal details of the account holders behind 35,711 IP-addresses. As the chart below shows, that’s already more than the two previous years combined. Also, the number of targeted people exceeds that of all US and Canadian file-sharing cases in 2018, which is quite extraordinary. The data draws on filings submitted to the Patent and Market Court since 2016. These also reveal which ISPs are most often targeted. 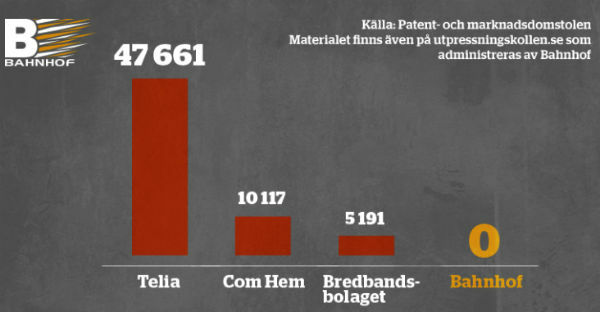 The vast majority of all requests are made to Telia, followed by Com Hem, and Bredbandsbolaget. Bahnhof persistently objects to handing over customer data for these types of cases. It keeps its IP-address allocation logs limited to 24-hours and stresses that it has never handed over any data to the rightsholders in question. “The real winners are, of course, Bahnhof’s customers. Bahnhof never has, and will never hand out its customers’ details for this kind of business,” Lindahl notes. While the ISP is using these figures to promote its own business, the company ultimately hopes that the Government will step in and put an end to these ‘copyright trolling’ practices. Bahnhof says that there are clear shortcomings in current legislation and that the evidence these cases rely on is far from solid. Despite this, the number of lawsuits keeps rising at a rapid pace. “It’s time to reverse the trend before another 100, 1000 or 10,000 individuals have to join the growing group of victims. The practice of sending extortion letters to internet users solely based on IP-addresses does not meet any requirements of legal certainty and must be stopped,” Bahnhof’s Communicator stresses.